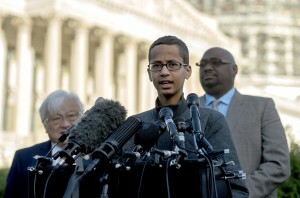 WASHINGTON — Ahmed Mohamed, the Texas teenager arrested after a homemade clock he brought to school was mistaken for a bomb, capped a whirlwind month with a visit to the White House on Monday. Ahmed got a personal invitation from President Barack Obama for “Astronomy Night.” The two met and chatted briefly during Monday night’s event. Last month, Ahmed brought the clock to his school to show a teacher, but another teacher thought it could be a bomb. The school contacted police, who ultimately chose not to charge Ahmed with having a hoax bomb, though he was suspended from school. Obama subsequently Tweeted an invitation to Ahmed and said the U.S. should inspire more kids like him to enjoy science. Ahmed’s family is looking at several options for a new school. He hopes to eventually go to the Massachusetts Institute of Technology and become an engineer. The White House invitation brought some backlash. Republican presidential candidate Ted Cruz complained that Obama didn’t give law enforcement officials the same respect he’s giving Ahmed. White House spokesman Josh Earnest said Monday the president has made clear in many settings the respect he has for law enforcement officers. Ahmed said he has visited Google and Facebook, along with other companies and institutions in recent weeks. He also visited with the president of Sudan, Omar al-Bashir, which has prompted some criticism because al-Bashir is wanted by International Criminal Court on charges of genocide and war crimes for atrocities linked to the Darfur fighting. Advisers deflected a question on that topic and instructed Ahmed to not answer. Ahmed posed for pictures with NASA astronaut Alvin Drew shortly before Obama addressed the students on the South Lawn, and he got to introduce himself to the president when Obama waded out toward the audience to shake hands with visitors after his speech. Obama told the crowd that NASA was developing the capabilities to send humans to Mars in the 2030s. The students visiting the South Lawn of the White House on Monday night got the chance to explore samples of rocks from the moon, Mars and various meteorites. They met with astronauts and peered at the planets and stars through telescopes.